Before the great Madame Tussauds Wax Museum Building on Hollywood and Orange was erected, tourists walking to and fro the Hollywood Highland center would dodge cars coming in and out of the busy overpriced parking lot that used to be there. Vendors rented the outer edge next to the Grauman’s TCL Chinese Theater and sold tourist novelties of all sorts out of tents which gave a real flea market effect. There was a row of pay phones that never worked and no protection from the sun which the Tussauds Building now gives cover from part of the day. 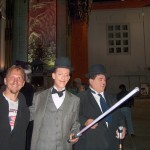 I was a street performer at that time, the Cat in the Hat, the tourist’s would line up in front of the Kodak Theatre to get pictures with me left and right. When I would venture by the parking lot the photos stopped, with the cars blocking the sidewalk and the blistering sun hurling itself directly upon my costume, pure misery I tell ya. That all changed one day to my amazement when someone decided to release wild hogs in that old run down dilapidated parking lot, Wild Hogs on DVD that is. The whole lot was rented and a Wild Hogs DVD Release Party was set up to look just like a small town Strawberry Festival with games, a mechanical bull, and free food and drinks. Live music from an awesome live country band filled the airwaves as everyone enjoyed themselves from the tourist to the panhandler. Always carrying a pocket camera I got great footage of the event but YouTube claimed copyright on the music those good old boys were playing, it’s hopefully still on one of my hard drives. Months earlier I was Playing around with a friends camcorder on the night of the Wild Hogs Movie Premiere at Disney’s El Capitan Theatre and filmed the cast coming out. The footage went home with the friend though, bummer. Things changed forever between myself and the parking lot after that day, cars stopped parking there, the vendors in the tents disappeared, the pay phones were ripped out, and bulldozers showed up, Madame Tussauds Wax Museum was on its way. My amateur low quality shot of the parking lot sign being torn down by a bulldozer is without a doubt my all time favorite piece of cinema, lol. I had planned to film all construction phases but only got so far after gaining a HD Camera from the Circuit City going out of business sale, the pocket camera I carried to Hollywood Blvd. everyday no longer interested me after editing HD footage. It seemed like forever but eventually a bright new building stood in the place of that wretched parking lot which not only kept the sun off my new Barney Costume but also extended the euphoria of the tourists who would line up to my left and right for photos while entering, leaving, and merely passing by Madame Tussauds Wax Museum. 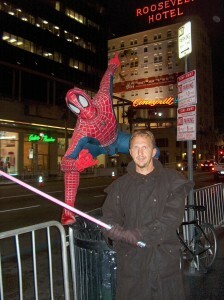 While working the tourists on Hollywood Blvd. as a street performer I always carried a pocket camera, when things got slow I would make chintzy productions with the other performers then stay up all night editing. After making over 300 short films I wrote a movie called Woggie, it’s about life as a Hollywood Character, I filmed it over a 3.5 year span. Enjoy, Abe R. Rated. Nothing can compare to an experience at the movies, the anticipation of the film from weeks of trailers and promos via the radio, TV, and yes, the double-edged sword known as the World Wide Web. The line outside the movie theater, the freshly printed tickets, the hopefully pleasant teen taking your ticket and ripping it in half, does it get any better. Lets go back to the line for a quick look at how many people had their faces introverted towards a mobile phone screen, a few I would imagine, and the movie tickets were more than likely printed instantly from a computer. As far as the teen taking your ticket who saw the movie several times already, he has probably tweeted the ending and action scenes so deep into cyberspace not even Hal from 2001 a space odyssey could undo the damage. Months after the films release comes the DVD. The DVD has been slowly phasing out and is being replaced by venues like On Demand, Amazon Instant Video, and Google Play, but in my opinion Hollywood is not taking full advantage of the situation. How can Hollywood take the Grade A movie experience to the internet and the big screen? It would have to start with the writer, story development, and character development. Aside from the actual screenplay which has to be a certain length and a well calculated formula to wow ’em at the box office, the writer now has the opportunity to expand the film in-depth with story and character development plots which can be written and filmed as part of the project but exclusive for the internet. This extra content can set the stage for where the story is based, how things came to be at the beginning of the actual film, and deeply define the characters in the film. A fee can even be charged to view the clips for proven blockbuster movies with a huge fan base while the whole time promoting the film. I was very impressed with a Lions Gate clip release for Conan The Barbarian (2011), it was well done and made me want to watch the film with its action, length and give, better than a trailer. A scene like that released on the internet sets up story line and character development sure to lead people to the box office. Now lets take one of my favorite films as to how it could have integrated more with the internet, The Dark Knight, an awesome job was done promoting this film and this is just an example due to its popularity having a billion+ in ticket sales. Could short films aside from the feature film be written and shot with the film strictly for story and character development, then released on the internet before the film. How did the Joker really get the scars on his mouth could be turned into a short film and released via the internet for a 99 cent download months before the feature is released. This is advertising, revenue, and deep story development. Here is a clip I found of a fan telling the Joker (Origins). Any of the Batman scenes which flash back to Bruce Wayne’s childhood for less than a minute could be used to an advantage, scenes like that are painstakingly set up and filmed. Why not write and film a short beefing up the scene adding extra characters strictly for an internet clip, the fans would love it and it would promote the film. In The Dark Knight Rises where there was an 8 year gap from the ending of The Dark Knight story line, could the writers of written some shorts to fill the audience in on a few things that transpired during the 8 years? Once again I must say Chris Nolan did an excellent job with his Batman Trilogy and I wouldn’t change a thing, I use it as an example because the franchise is so well-known. I took things one step further with my independent film Woggie (2012). I designed the whole feature to be 12 internet webisodes that stood on their own and released them as I filmed the movie. With so many films being made at present time and going straight to the internet what makes mine different? I packaged it with the 12 webisodes, 4 reality documentary shorts, and 3 music videos to go with the Soundtrack. Photo used as Woggie Webisodes poster. 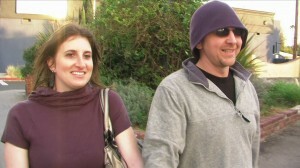 Photo from Documentary scene for Woggie the movie. Cast of Stalker scene from Woggie the movie. Abe R. Rated on the phone for Bus Jacker scene from Woggie the Movie. 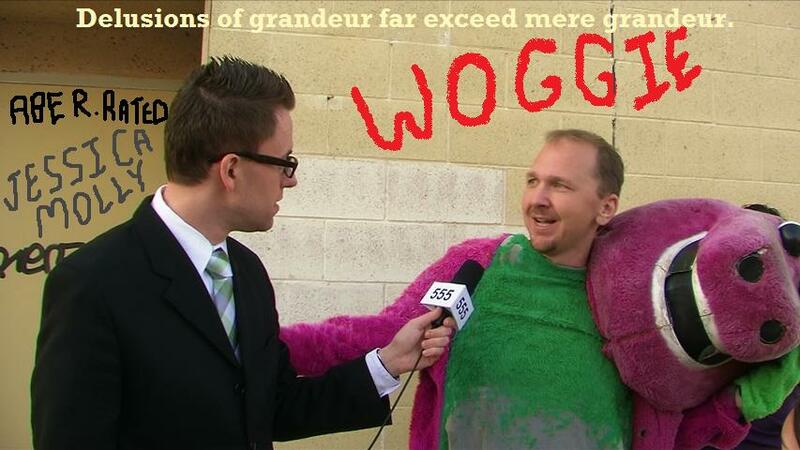 Photo from the final scene of Woggie the movie. Photo from Stalker shoot for Woggie the movie. Photo from Little Dude shoot for Woggie the movie. 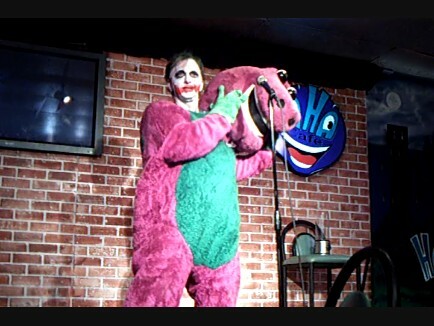 Photo from comedy club shoot for Woggie the Movie. Photo from documentary shoot for Woggie the Movie. Photo from Back to the Cleaners scene for Woggie the Movie. 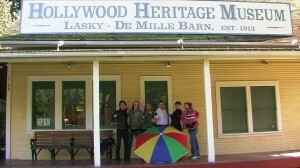 Photo from Meeting Elvis shoot for Woggie the Movie. Photo from The Birdss shoot for Woggie the movie. 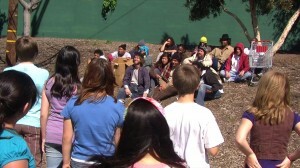 Photo from Hollywood High Shoot for Woggie the Movie. 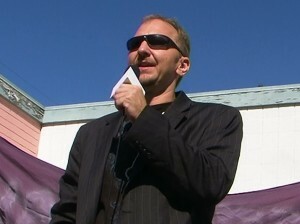 Photo from Open Mic scene for Woggie the Movie. When I first submitted my independent film Woggie (2012) to IMDB at the end of 2010, there were 12,500 movie titles in production. Now in 2013 there are over 25,000 films listed as in production, talk about competition on a planet brought together with the internet, affordable HD cameras, and complex editing software that caters to the novice. I made an independent film in Hollywood at a time when I could of made a movie anywhere simply because I am a nostalgic fool that loves Hollywood. My film in no way competes with A Good Day to Die Hard but I felt like John McClane at times making a movie where the studio system rules the land. During production of my film actors would pull me aside and ask for custom made demo reels and advice on how to make their own movies. Usually I had a story board in one hand, a camera in the other, and was wearing a dinosaur costume, I was simply too busy. I finally have enough time to lay out some free simple techniques an actor or filmmaker can use to get started networking and publicizing themselves in an industry quickly evolving into a global digital monster. If you live in Idaho, stay in Idaho, get involved with local filmmakers, act and make movies about living in Idaho, that way you have a chance of creating something different, new and attention grabbing. After you have a few unique films in your credits you can go to Los Angeles or New York and will be ahead of most actors. My favorite Steven Spielberg movies are the ones he made in his backyard as a kid because the battle scenes he envisioned then eventually became Saving Private Ryan. Twitter and Facebook are great basic platforms and necessary but even the old lady that lives up the street from me is on Twitter and Facebook. Filmcommunity.com is a social networking site for the film industry, I recently signed up and was amazed at all the options for sharing my film and music. The site is user friendly with easy to follow instructions on how to upload video, pictures, and music to your profile. There is a page where all members can embed their movie trailers and a page for members to share their music. You can display a live Twitter feed on your profile page, post status updates, link to your website and films, promote events, and most impressively you get a fully functional blog to write posts about your filmmaking adventures. You must sign up for a free membership to view profiles and interact with other members. Webs.com is an awesome free website provider. I need another website like a hole in the head but found myself building one at 2am on Webs.com and couldn’t believe how user friendly and easy to navigate this website builder was. You get a large selection of templates and a well designed easy to use control panel for adding pictures, video, text, and social sharing buttons. You can create multiple web pages and even add custom HTML code. The site you create will be search engine friendly and is set up with an option for adding Google Analytics. A free mobile version is also available. Since this service is free ads may appear on your website and be sure to read the terms of service about the content you put on the site. Simply adding headshots, a demo real, and a filmography are ideal for this service, you can always upgrade to remove the ads.